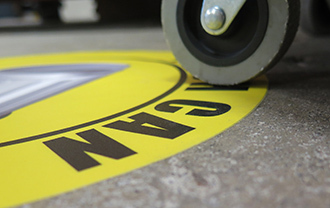 Simple floor signs can help keep the workplace organized and increase efficiency. Place this trash can floor sign in the spots where you want your trash cans to go. This way trash bins will always end up back where you want them. 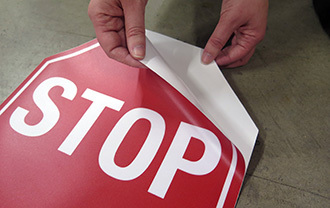 These durable signs are made from a tough industrial material that resists damage from traffic and forklifts, as well as damage from water, UV rays, and chemicals. 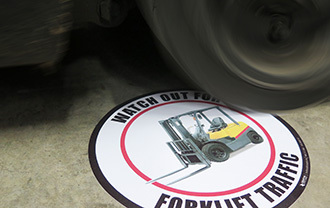 This trash can floor sign comes in 8 sizes ranging 8” to 36” in diameter. Use signs like this one as part of your 5S program or to simplify communication and organization in your facility. Received product quickly and came as described. Easy to apply. You guys have have great signsI We also enjoy the nice touch with the Skittles. The Trash Can is excellent. It is very basic. The item is quite a resilient sign and can stand up to pedestrians and also forklifts. Really simple to peel and stick we also like the fact that you ship fast and added Skittles in the box!